A 1789 French hand tinted etching that depicts the Storming of the Bastille during the French Revolution. In late 1788, Jacques Necker announced that the meeting of the Estates General would be brought forward to January 1, 1789 (in reality, it didn't meet until May 5th of that year). However, this edict neither defined the form the Estates General would take nor set out how it would be chosen. Afraid that the crown would take advantage of this to 'fix' the Estates General and transform it into a servile body, the Parlement of Paris, in approving the edict, explicitly stated that the Estates General should take its form from the last time it was called: 1614. This meant the estates would meet in equal numbers, but separate chambers. Voting would be done separately, with each having a third of the vote. Bizarrely, no one who had called for the Estates General over the past years appears to have previously realized what soon became obvious: the 95% of the nation who comprised the third estate could be easily outvoted by a combination of the clergy and nobles, or 5% of the population. Recent events had set a very different voting precedent, as a provincial assembly which had been called in 1778 and 1787 had doubled the numbers of the third estate and another called in Dauphin had not only doubled the third estate but allowed for voting by head (one vote per member, not estate). However, the problem was now understood, and a clamor soon arose demanding the doubling of third estate numbers and voting by head, and the crown received over eight hundred different petitions, mainly from the bourgeois who had woken up to their potentially vital role in future government. Necker responded by recalling the Assembly of Notables to advise himself and the king on the various problems. It sat from November 6th until December 17th and protected the nobles' interests by voting against doubling the third estate or voting by head. This was followed by the Estates General being postponed by a few months. The uproar only grew. On December 27th, in a document entitled 'Result of the King's Council of State'—the result of discussion between Necker and the king and contrary to the advice of the nobles—the crown announced that the third estate was indeed to be doubled. However, there was no decision on voting practices, which was left to the Estates General itself to decide. This was only ever going to cause a huge problem, and the result changed the course of Europe in a way the crown really, really wished they had been able to foresee and prevent. The fact that the crown allowed such a situation to arise is one of the reasons why they have been accused of being in a malaise as the world turned around them. The debate over the size and voting rights of the third estate brought the Estates General to the forefront of conversation and thought, with writers and thinkers publishing a wide range of views. The most famous was Sieyès' 'What is the Third Estate,' which argued that there shouldn’t be any privileged groups in society and that the third estate should set themselves up as a national assembly immediately after meeting, with no input from the other estates. It was hugely influential, and in many ways set the agenda in a manner the crown did not. Terms like 'national' and 'patriotism' began to be used ever more frequently and became associated with the third estate. More importantly, this outburst of political thought caused a group of leaders to emerge from the third estate, organizing meetings, writing pamphlets, and generally politicizing the third estate across the nation. Chief among these were the bourgeois lawyers, educated men with an interest in the many laws involved. They realized, almost en masse, that they could start to reshape France if they took their chance, and they were determined to do so. To choose the estates, France was divided up into 234 constituencies. Each had an electoral assembly for the nobles and clergy while the third estate was voted on by every male taxpayer over twenty-five years of age. Each sent two delegates for the first and second estates and four for the third. In addition, every estate in every constituency was required to draw up a list of grievances, the "cahiers de doleances." 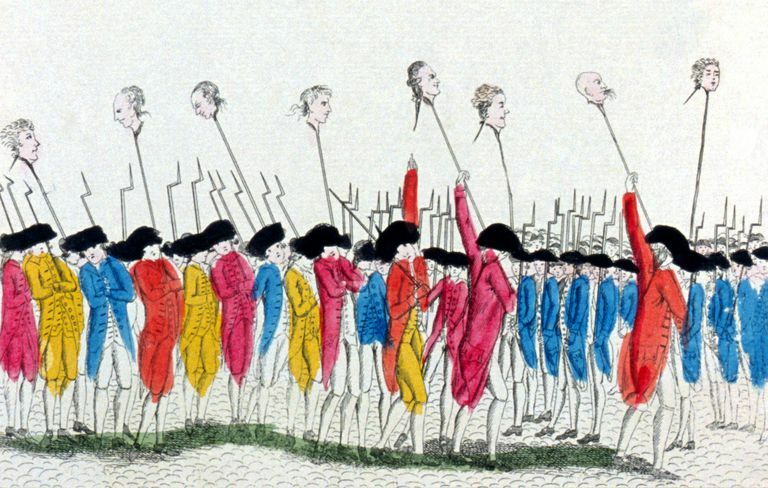 Every level of French society was thus involved in voting and vocalizing their many grievances against the state, drawing in people across the nation. Expectations were high. The election results provided the elites of France with many surprises. Over three-quarters of the first estate (the clergy) were parish priests rather than the previously dominant orders like bishops, less than half of which made it. Their cahiers called for higher stipends and access to the highest positions in the church. The second estate was no different, and the many courtiers and high-ranking nobles, who assumed they’d be automatically returned, lost out to lower level, much poorer men. Their cahiers reflected a very divided group, with only 40% calling for voting by order and some even calling for voting by head. The third estate, in contrast, proved to be a relatively united group, two-thirds of which were bourgeois lawyers. The Estates General opened on May 5th. There was no guidance from the king or Necker on the key question of how the Estates General would vote; solving this was supposed to be the first decision they took. However, that had to wait until the very first task was finished: each estate had to verify the electoral returns of their respective order. The nobles did this immediately, but the third estate refused, believing that separate verification would inevitably lead to separate voting. The lawyers and their fellows were going to put their case forward from the very start. The clergy passed a vote which would have allowed them to verify but they delayed to seek a compromise with the third estate. Discussions between all three took place over the following weeks, but time passed and patience began to run out. People in the third estate began to talk about declaring themselves a national assembly and taking the law into their own hands. Critically for the history of the revolution, and while the first and second estates met behind closed doors, the third estate meeting had always been open to the public. The third estate deputies thus knew they could count on tremendous public support for the idea of acting unilaterally, as even those who didn't attend the meetings could read all about what happened in the many journals which reported it. On June 10th, with patience running out, Sieyès proposed that a final appeal should be sent to the nobles and clergy asking for a common verification. If there wasn’t one, then the third estate, now increasingly calling itself the Commons, would carry on without them. The motion passed, the other orders remained silent, and the third estate resolved to carry on regardless. The revolution had begun. On June 13th, three parish priests from the first estate joined the third, and sixteen more followed in the next few days, the first breakdown between the old divisions. On June 17th, Sieyès proposed and had passed a motion for the third estate to now call itself a National Assembly. In the heat of the moment, another motion was proposed and passed, declaring all taxes illegal, but allowing them to continue until a new system was invented to replace them. In one quick motion, the National Assembly had gone from simply challenging the first and second estates to challenging the king and his sovereignty by making themselves responsible for the laws on tax. Having been sidelined with grief over the death of his son, the king now began to stir and the regions around Paris were reinforced with troops. On June 19th, six days after the first defections, the entire first estate voted to join the National Assembly. June 20th brought another milestone, as the National Assembly arrived to find the doors of their meeting place locked and soldiers guarding it, with notes of a Royal Session to occur on the 22nd. This action even outraged opponents of the National Assembly, members of which feared their dissolution was imminent. In the face of this, the National Assembly moved to a nearby tennis court where, surrounded by crowds, they took the famous 'Tennis Court Oath,' swearing not to disperse until their business was done. On the 22nd, the Royal Session was delayed, but three noblemen joined the clergy in abandoning their own estate. The Royal Session, when it was held, wasn't the blatant attempt to crush the National Assembly which many had feared but instead saw the king present an imaginative series of reforms which would have been considered far-reaching a month before. However, the king still used veiled threats and referred to the three different estates, stressing they should obey him. The members of the National Assembly refused to leave the session hall unless it was at bayonet point and proceeded to retake the oath. In this decisive moment, a battle of wills between king and assembly, Louis XVI meekly agreed they could stay in the room. He broke first. In addition, Necker resigned. He was persuaded to resume his position shortly afterward, but the news spread and pandemonium broke out. More nobles left their estate and joined the assembly. With the first and second estates now clearly wavering and the support of the army in doubt, the king ordered the first and second estates to join the National Assembly. This triggered public displays of joy and the members of the National Assembly now felt they could settle down and write a new constitution for the nation; more had already happened than many dared to imagine. It was already a sweeping change, but the crown and public opinion would soon change these expectations beyond all imagining. The excited crowds, fueled by weeks of debate and angered by rapidly rising grain prices did more than just celebrate: on June 30th, a mob of 4000 people rescued mutinous soldiers from their prison. Similar displays of popular opinion were matched by the crown bringing ever more troops into the area. National Assembly appeals to stop reinforcing were refused. Indeed, on July 11th, Necker was sacked and more martial men brought in to run the government. A public uproar followed. On the streets of Paris, there was a sense that another battle of wills between the crown and people had begun, and that it might turn into a physical conflict. The storming of the Bastille demonstrated to the king that he couldn’t rely on his soldiers, some of whom had already defected. He had no way of enforcing royal power and conceded, ordering the units around Paris to withdraw rather than try and start a fight. Royal power was at an end and sovereignty had passed to the National Assembly. Crucially for the future of the Revolution, the people of Paris now saw themselves as the saviors and defenders of the National Assembly. They were the guardians of the revolution.